Natural finish and shape. This unique eyebrow pencil only releases color pigment when it interacts with the oils in the brow hairs. The result is natural, defined brows. Smudge-proof and long-lasting. Shu Uemura’s Hard Formula Long-Lasting Brow Pencil is my new HG brow product. While I thought that I loved my Anastasia brow pencil, the Shu has made me realize that that was mere puppy love–but this my dear readers is the real thing! 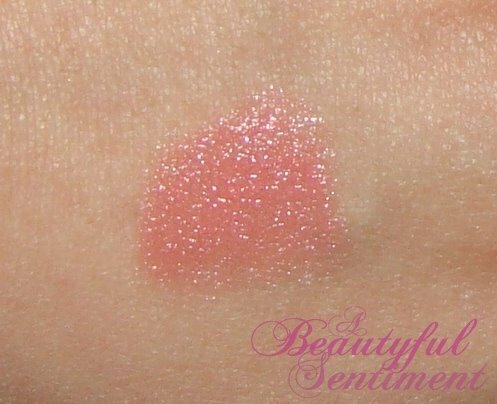 First of all check out my “swatch” of this product. No I haven’t lost it, that’s really the swatch! 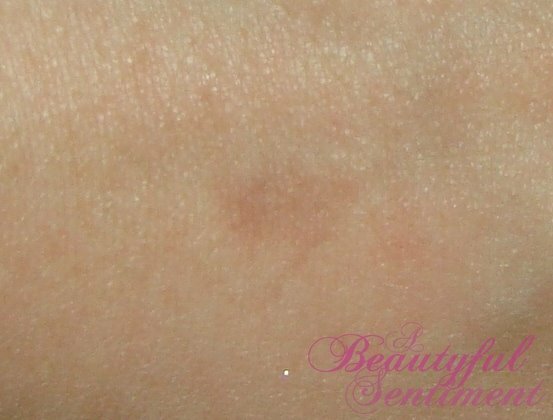 In the center of the photo you’ll see an ashy kind of reddish spot-that’s from vigorously rubbing the pencil on my skin. The cool (and great) thing about Shu’s Hard Pencil is that the color is only released by the natural oils in your face, and you therefore don’t have to worry about ending up with drawn-in looking Sharpie brows! This long-lasting oily-skin resistant pencil provides a natural, soft look that never looks drawn in while providing great definition. 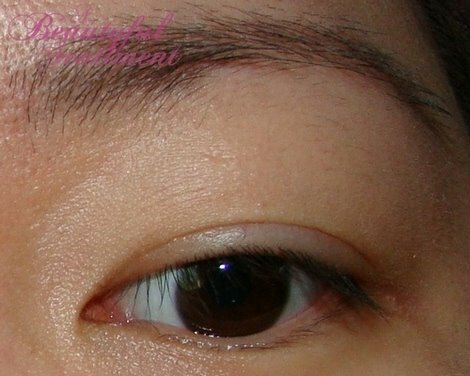 Starting from the center of your eyebrow work outwards, then go back and fill in the inner portion of your brows, working in short feathery strokes, and voila instant gorgeous brows that never look over done no matter how over-zealous you may get with the pencil. I’m wearing the pencil in shade Seal Brown, which is basically the default shade for all skin and hair tones. It quite literally works for everybody, so if you have a chance do check it out, it’ll rock your world! After letting my brows grow wild for a month or so, I decided that since I’d be leaving for Korea soon (well by the time you guys read this I’ll be gone =P) it was about time to tame the ilttle beasties. My trusty Tweezersmans had been stolen by my brother (he stole BOTH!!! my silver pair and my pink pair grrrrr!) and I couldn’t find my cute little pink Japanese brow strimming scissors that had attached comb guides, and in my desperation I happened upon this little set sitting unused on my dresser. 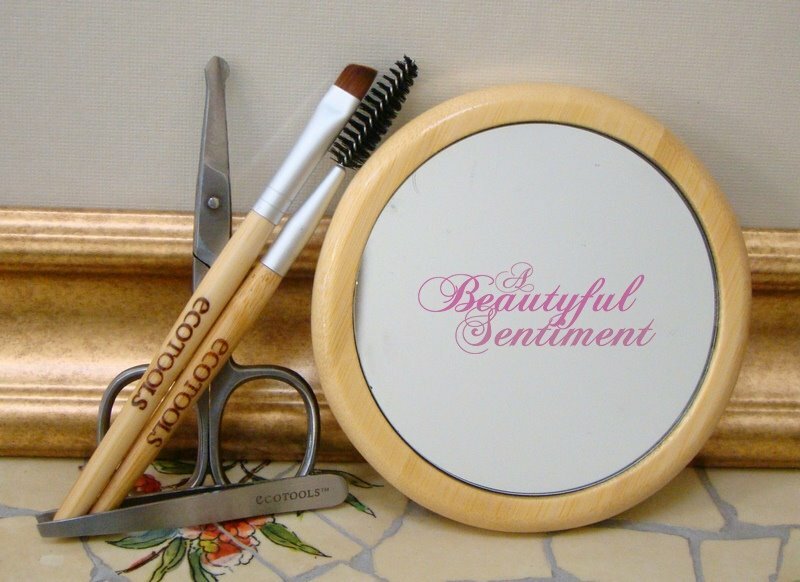 This cruelty-free, recycled set consists of brow scissors, an adorable mini tweezer, a spoolie brush and angle brow brush, and a 5x mirror with suction cups on the back. 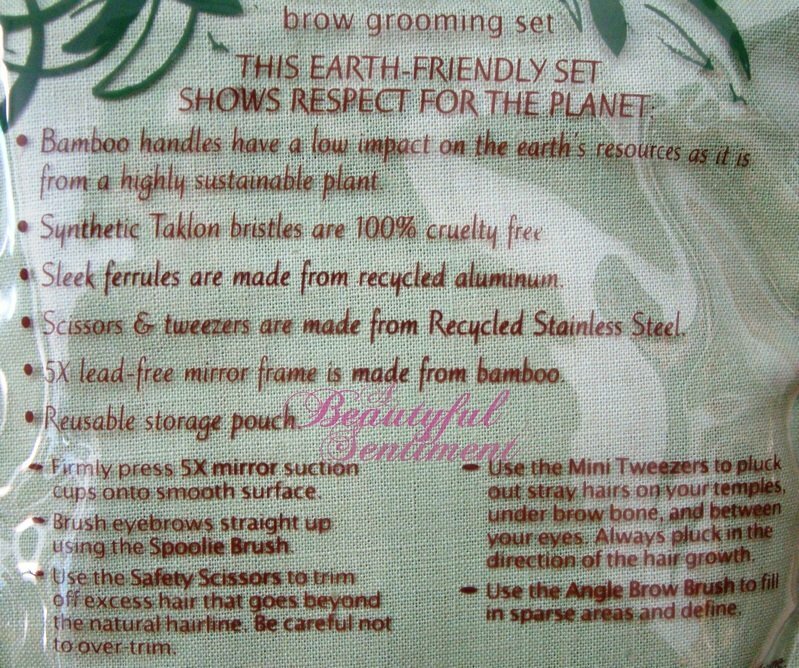 This set is quite literally my solution for perfect brows in an eco-friendly bag. The straight edge of the scissors made trimming my overgrown eyebrows a piece of cake, and the tweezers were actually almost as good as my Tweezermans. And of course it doesn’t hurt that this whole set costs less than one pair of Tweezerman tweezers! Also, let me just say that if you don’t own a magnifying mirror, you don’t know what you’re missing out on! I never knew how helpful a 5x magnification mirror could be in plucking my brows, but trust me it’s might helpful! 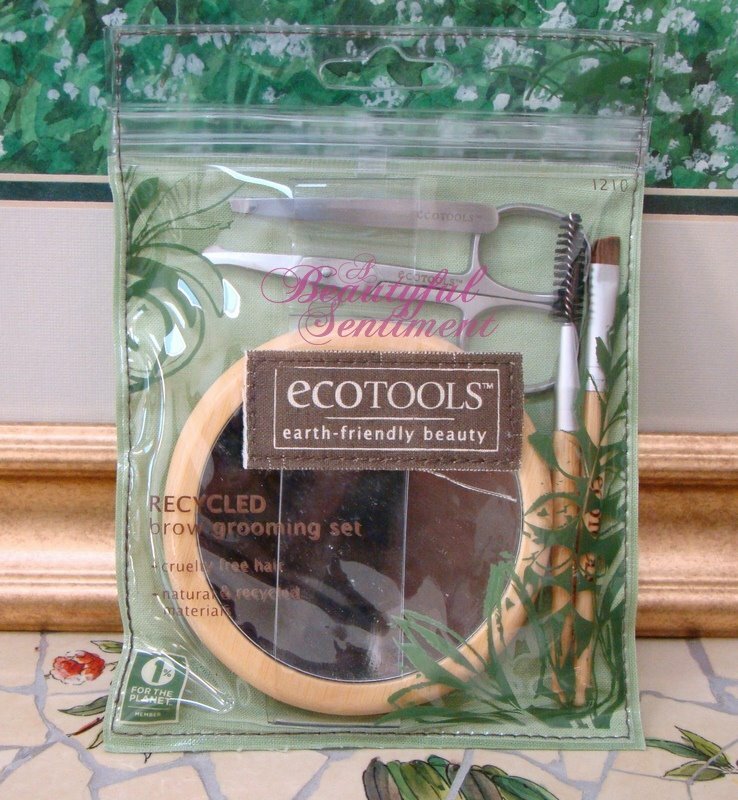 Look for ecoTOOLS products at your local drugstores (Rite Aide, Target, Walgreens, CVS, etc. ), they’re great! Revlon Runway Collection Nails and Fantasy Length Lashes! 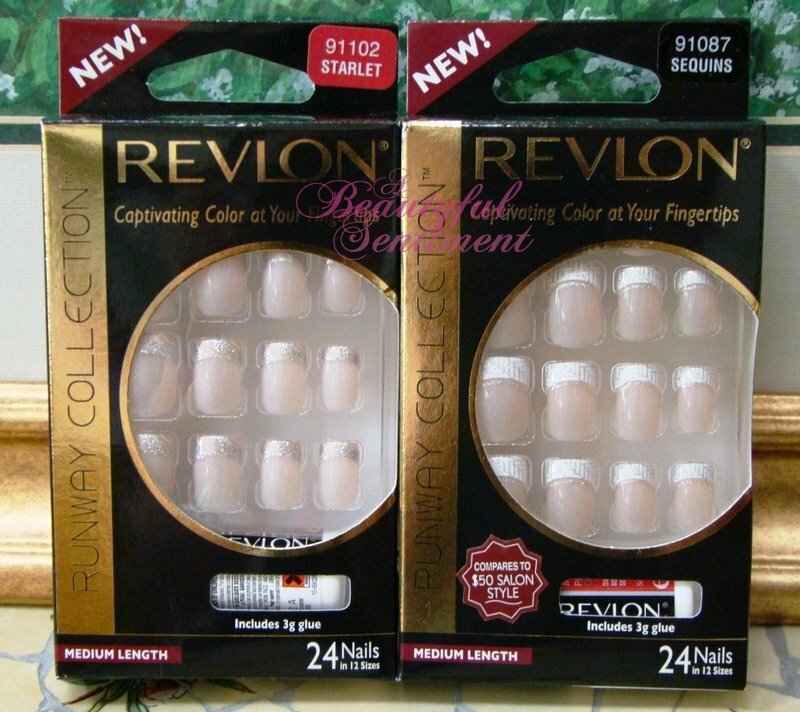 I haven’t played with artificial nails in well over a decade, but with my upcoming trip to Korea coupled with the fact that I had managed to break nearly every single one of my fingernails had me reaching eagerly for a box of Revlon’s Runway Collection Nails. 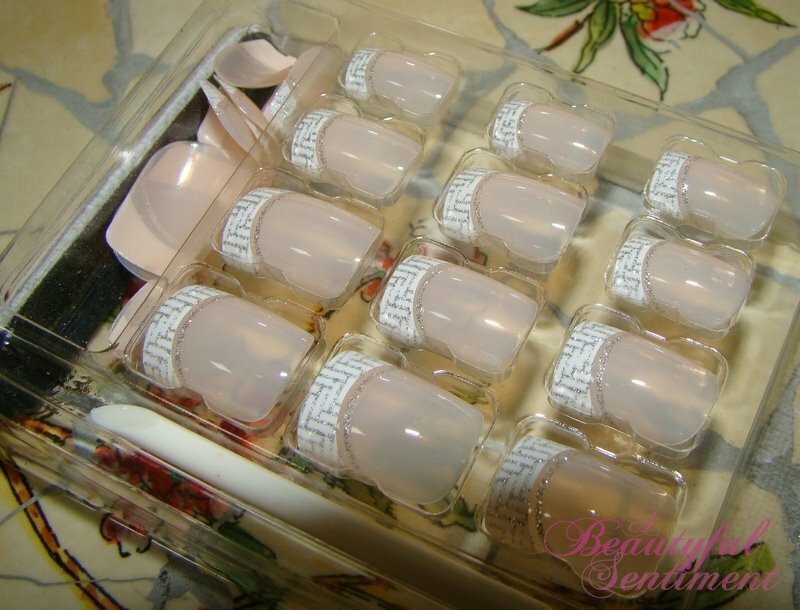 Revlon’s Runway Collection Artificial Nails come in a range of 12 sizes and are light and sheer enough that they successfully replicate the look of your natural nails, a nice feat for little pieces of plastic! 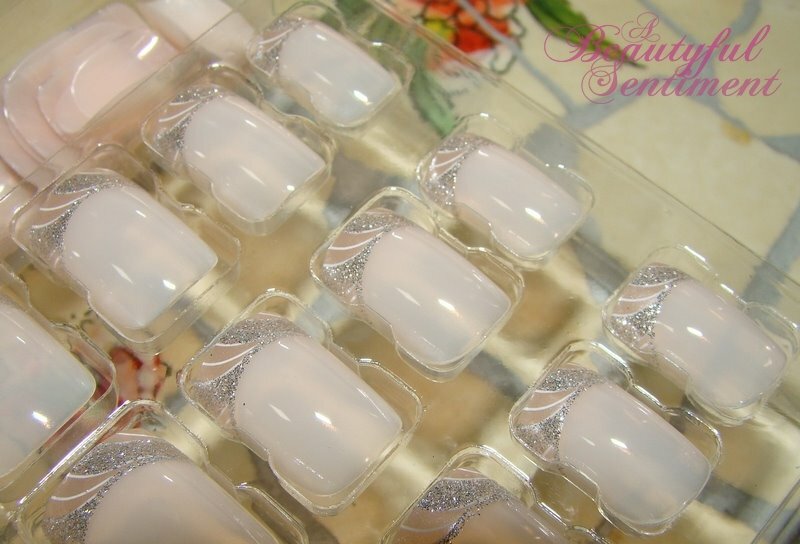 I have these in the MEDIUM length and I should warn that these really are quite short–I’ll hopefully be posting photos of the full set of these nails on my fingers within the next week or so. …so that come tomorrow morning I can slap these on before heading to the airport. I figured it would be better to apply these after showering since I’d like for them to last as long as possible. I’ll be updating with how well they wear/how they look/how long they last when I get back from Korea! And just to tide you over, here’s a photo of one of the Starlet nails on my thumb–isn’t it pretty? 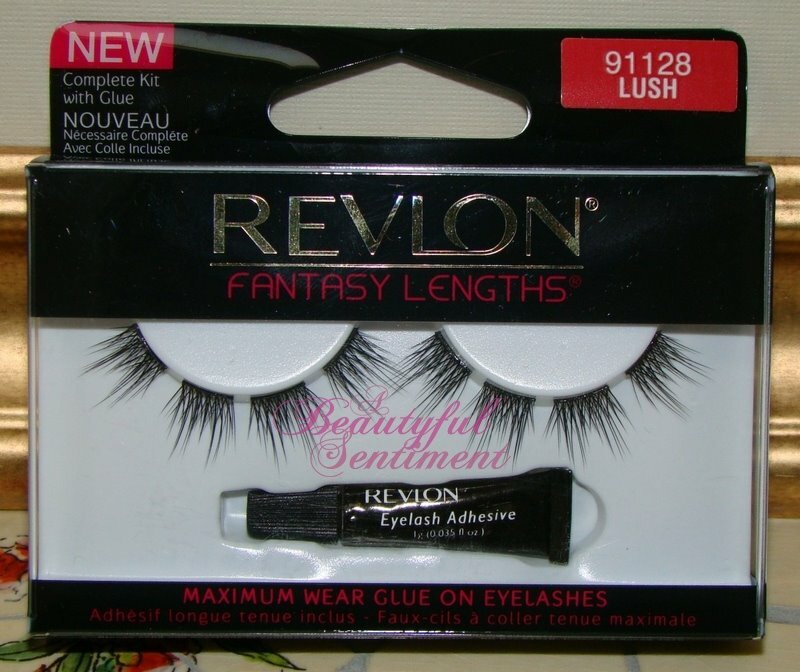 I also got a bunch of Revlon false lashes that I’m so ridiculously excited to experiment with. I feel the urge to do some fun and crazy EOTD’s using these! My favorite pair is the Lush–I love that I can create a custom look using these, as I sometimes find a full lash strip a bit hard to pull off. And all my other lashes! I promise that you’ll be seeing photos of all of these on at some point. Stay tuned for reviews, EOTD’s and more using these products as soon as I’m back from Korea. I miss you all already! And if you can’t wait until I get back, head to your local drugstore and check these products out for yourself–they’re very recessionista friendly at under $5 each! LOL I’m only kidding, but I will be leaving all you lovely readers for a week and a half as I travel to Korea w/my mom for some much needed mother/daughter time! I do so hate to leave you though! My flight leaves tomorrow morning, so I’ll be attempting to schedule some reviews and other stuff to auto-post periodically while I’m away so that you’re not too Jen-deprived. I’m also taking my laptop with me (if I could just find the darn adapter thing so that I can actually plug it in in Korea) so let’s hope that I can find some free WiFi~then I can at least check in every now and again. 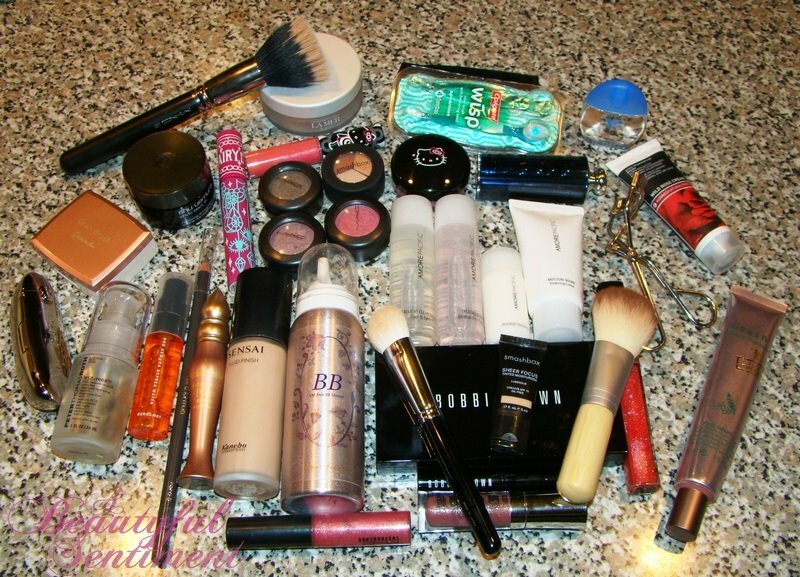 Wish me luck on the flight as I absolutely detest flying, and I’ll be putting together a post of all the stuff I’ll be cramming into my makeup bag tonight so that you can all see what a packrat I am! Oh and I’ll be allowing the comments to auto-post (meaning no comment moderation) while I’m gone so that you can chat amongst yourselves–just promise to behave! 🙂 And I’ll be responding to comments whenever I can get internet access. Guerlain Rouge G de Guerlain Jewel Lipstick Compact contains a ruby-powder formula that interacts with the light and creates a jaw-dropping pout of perfection. At first glaze, lips will be left defined, smoothed, plumped, and hydrated. Tucked in a compact that marries beauty with high design, with one click, you will have a luminous lipstick and mirror at your fingertips. Designed by Lorenz Bäumer, the most talented jeweler from the Place Vendôme in Paris, it is the ultimate accessory of mystery and seduction. 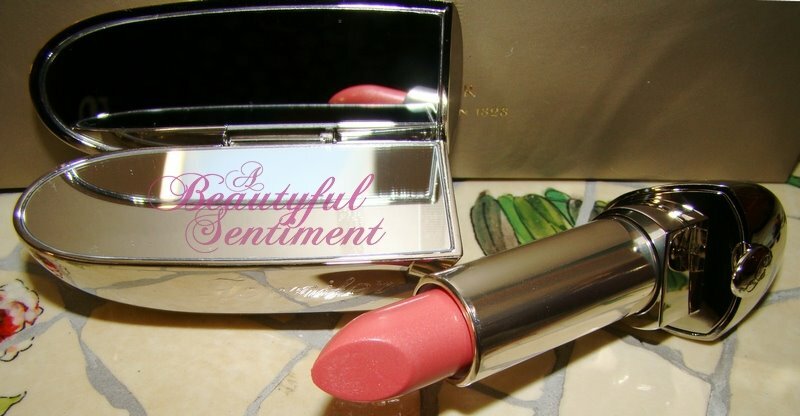 Despite my protestations and claims that I wouldn’t purchase this $45 lipstick, I caved =X. What can I say, I’m weak! I was doing so well until I saw that for two days only, Bergdorf Goodman was offering custom-engraving with the purchase of any of the Rouge G lipsticks. 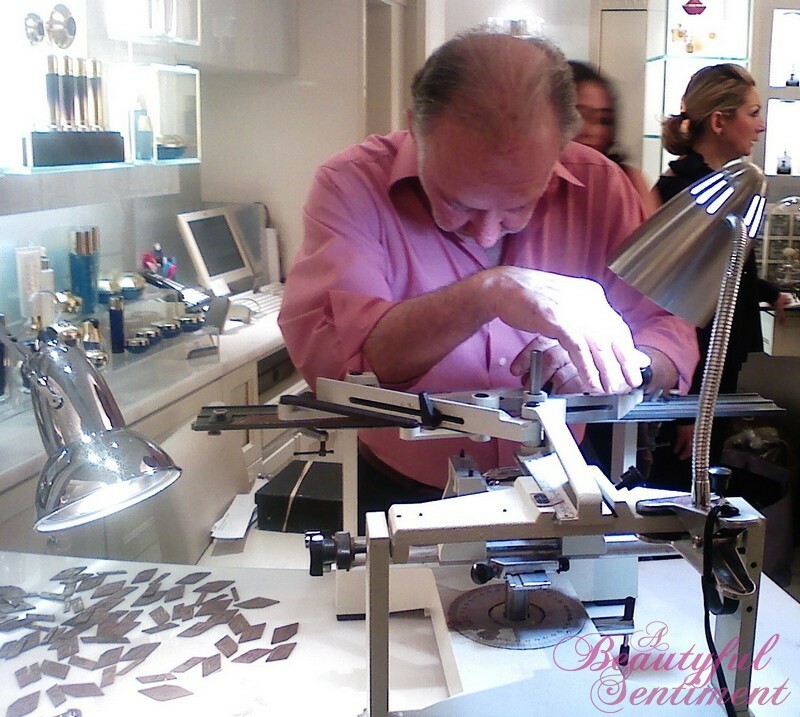 Check out my engraving in the photo below! Unfortunately the color selection kinda sucked and I wasn’t all that into most of the shades–they all veered towards either being too bright or too neutral, and there really just weren’t any of the usual pretty soft pinks that I naturally gravitate towards. I would’ve taken a stab at one of the brighter shades, but this lipstick is really creamy and pigmented and I just knew that I wouldn’t be comfortable. I ended up with shade #60, which is a pretty pale shimmery pink with hints of peachiness to it, and I must say the shade, which had been the only one that had caught my eye when I’d checked the Rouge G’s out a few weeks back, really works for me. 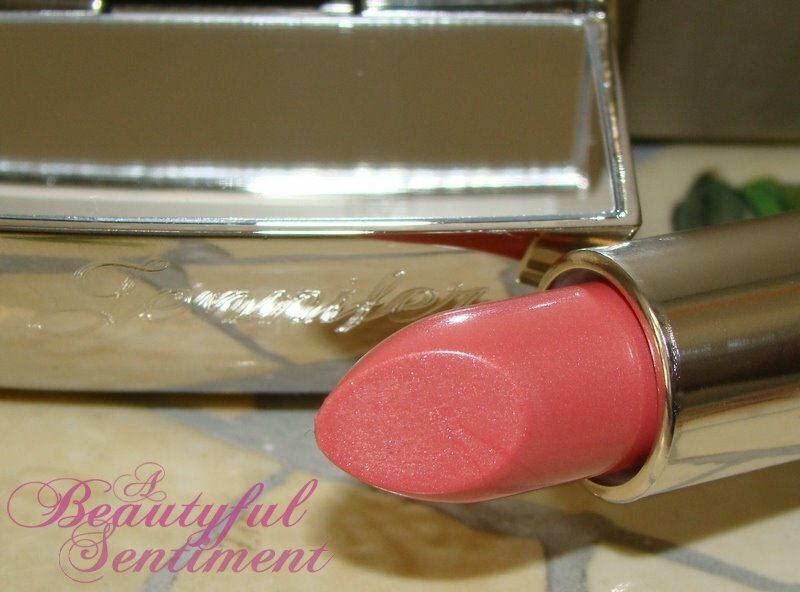 It’s a great everyday shade for a soft neutral lip and pairs amazingly well with a smoky eye. The formula is really nice, although I’m still not 100% convinced that it’s $45 nice. 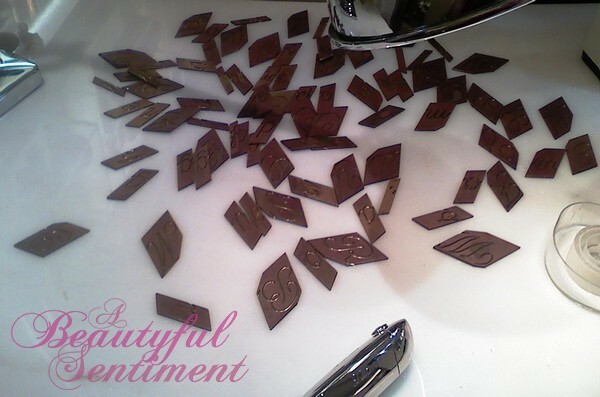 The Rouge G’s are super creamy, beautifully pigmented, decently long-lasting, non-drying, and all-around really nice. 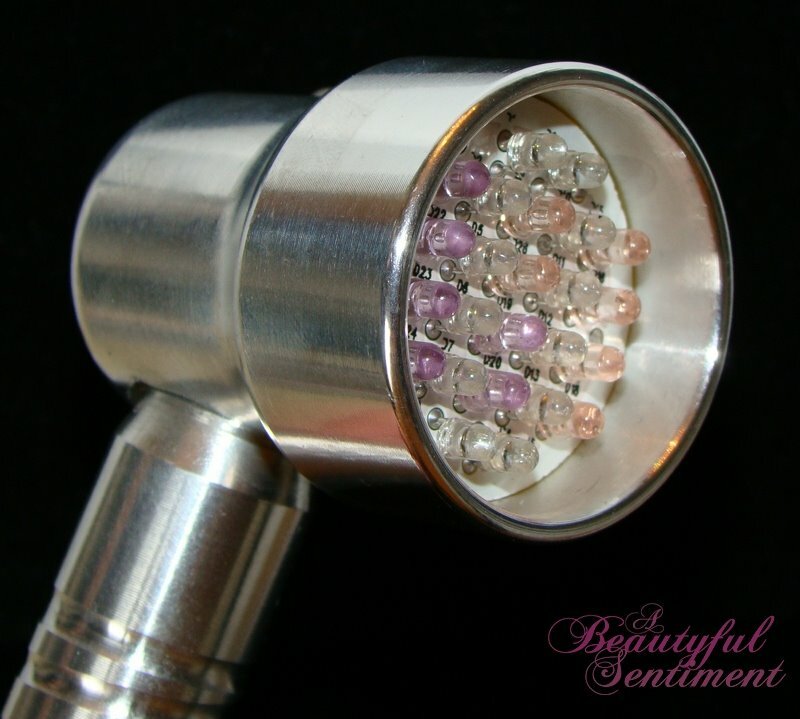 And of course the packaging is pretty stunning in and of itself–the bullet-shaped tube opens to reveal a discrete mirror that’s perfect for touch-ups on-the-go. The swatch above is a very accurate representation of what this shade looks like in person, but sadly I didn’t have nearly as much luck capturing Gabrielle on my lips. The pretty shimmer is absent, and you really can’t se too much of the pinkiness either. Guerlain’s Rouge G has made me realize that I actually own very few creamy lipsticks, and I’ve definitely acquired a new appreciation for them. While my wallet is still hurting from the $45+ tax hit it took, I am loving this shade quite a bit and will probably be wearing it constantly while I’m in Korea. Now to get through airport security with this hunk of metal sitting in my pocket! Don’t mind the poor photo quality, my camera battery decided to die on my so I had to resort to using my camera-phone =X. The engraver hard at work. He was such a sweet man! A cascade of letters strewn across his workspace. And the end result: Isn’t she a beauty? 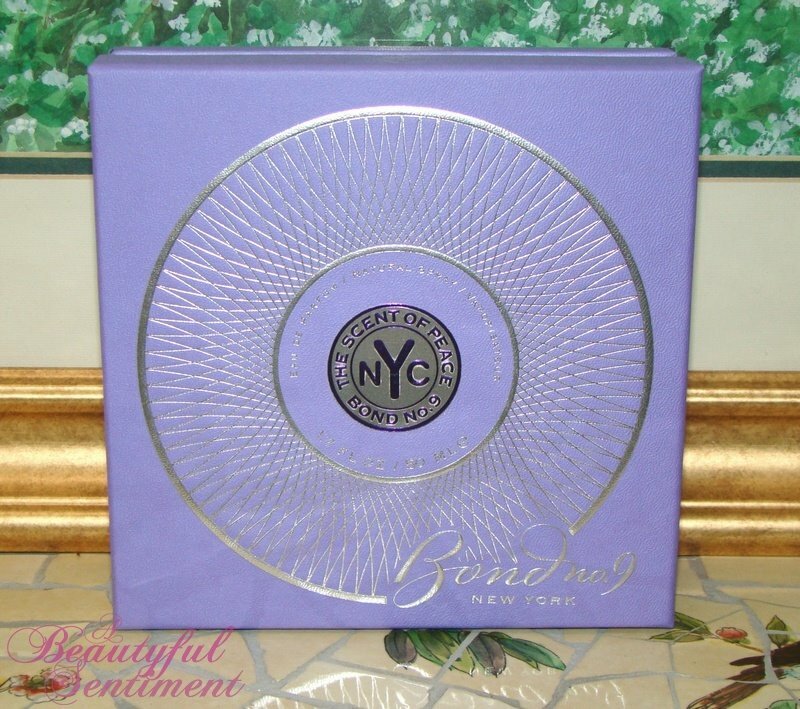 My Bergdorf Gift Card Event Haul! I’ve literally been waiting months for Bergdorf’s gift card event. You get $25 off your purchase of $100 or more and most SA’s will split up your purchases so that you get $25 off every $100 if they can, plus Bergdorf has the best GWP’s. 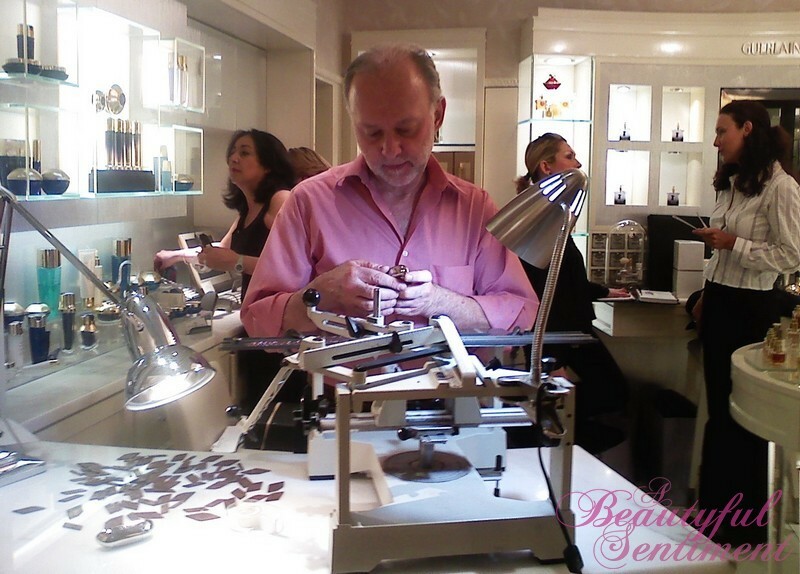 Bergdorf’s event was going on last week, so I definitely got my shop on! 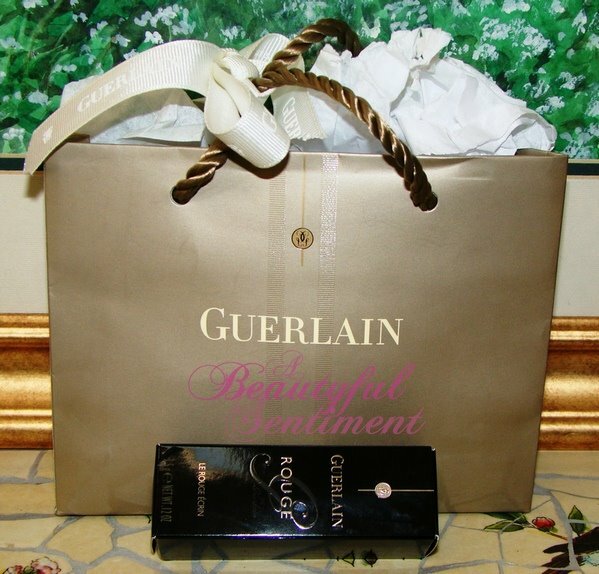 I had zero intention of picking up anything Guerlain, but they had free engraving on their new Rouge G de Guerlain lipsticks (see a few swatches HERE) and I just couldn’t resist picking one up so that I could get my name on it. Silly I know! You’ll get to see photos of it in a few days. I also stopped by the Shu counter and picked up their #18 foundation brush and their Hard Eyebrow Pencil (at the suggestion of Nicole). Now I’ve been a devoted Anastasia eyebrow pencil user for years and never thought I’d stray, but this pencil is seriously awesome and blows my Anastasia pencil out of the water. Plus it’s so ridiculously long. See a photo of it on me at the end of this post! 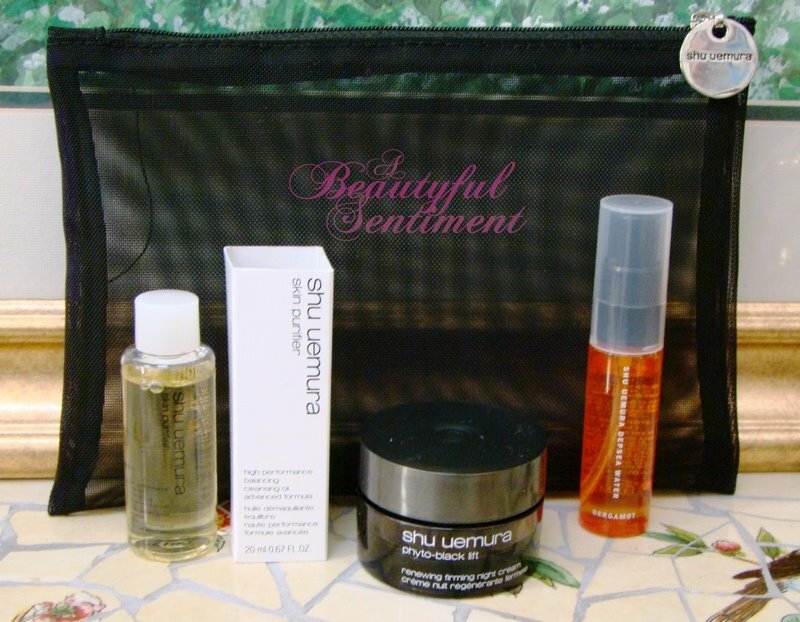 And my Shu Uemura GWP. 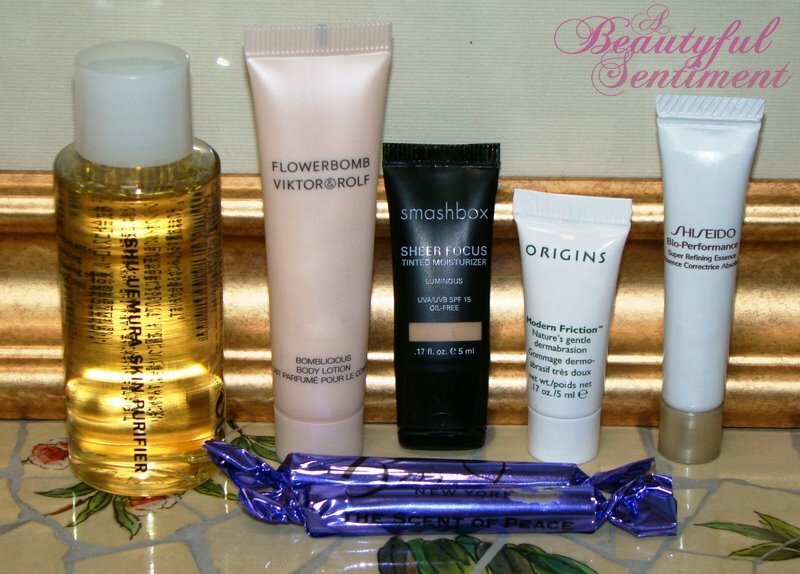 What’s great about Bergdrof’s GWP’s is that the samples are always much much larger than the samples that come in the gift bags at Bloomingdales, Saks, etc. I got a sample of cleansing oil, Depsea Water in Bergamot (I love these–I have a review of them somewhere on the blog), Phyto-Black Lift Night Cream, and (not picture) Phyto-Black Lift Eye Cream. 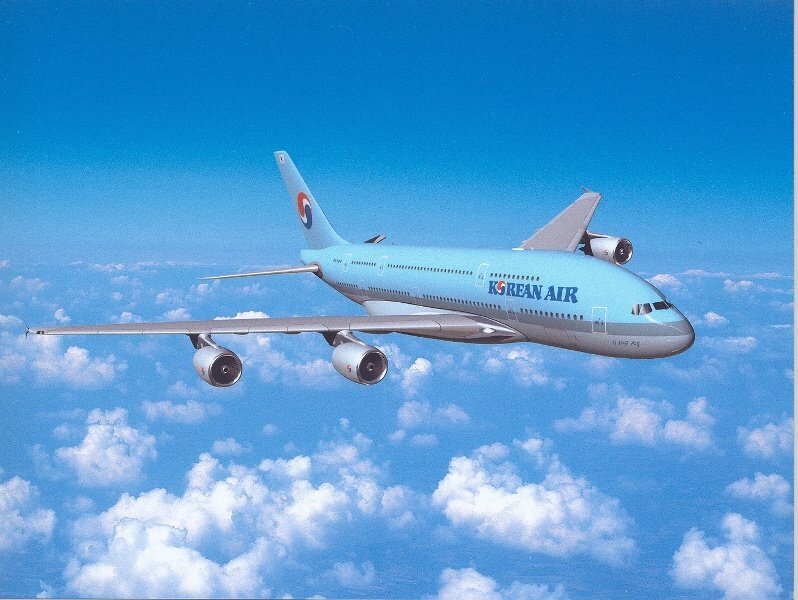 I’ll be making an official announcement in a separate post at some point, but I’m leaving for Korea on Wednesday and I’ll be gone for 10 days. I’m planning on taking all these great samples with me so that I can keep my complexion in tip-top shape while I’m away. Plus the Shu Depsea Facial Mists are fabulous for in-flight use; they keep your complexion from succumbing to the dryness of the recycled airplane air. I’ll be doing an in-depth review of what makes the pencil so great pretty soon so stay tuned for that. All in all I had a pretty stellar Saturday. The SO even surprised me by getting me an early birthday gift from Louis Vuitton!!! ❤ But you'll have to wait until I'm back from Korea to see photos of that. I’m usually not one to admire my own handiwork, but I have to say that I love this photo I took of the Baby Quasar. But all self-aggrandizement aside, it’s finally time to update you on my preliminary experiences with this petite little wand of miracles, which I introduced you to HERE. First comes my guilty confession: I haven’t been using this nearly as regularly as I should be because I’m lazy and just can’t seem to muster up the energy to spend 36 minutes holding the Baby Quasar up to my face some nights. BUT even with the limited use this has been receiving, I can without a doubt say that the Baby Quasar is pretty amazing. So what am I loving so far? Well I haven’t been using the Baby Quasar long enough to see the full-range of results (check out more info on the product site HERE), but this device is unparalleled for zapping away pesky pimples and eradicating cystic acne at its source. I was warned that the Baby Quasar might initially cause a few breakouts as it attempts to normalize your sebaceous glands (resulting in unclogged and tightened pores), and I did notice a few minor bumps, but when I used this on this monster I had forming on my chin, it literally dried it up overnight and it never came to a head. I also have some acne scarring on my chin due to a spurt of massive breakouts I experienced a few months back, and the Baby Quasar has definitely helped to fade those so that they’re much less visible. I’m confident that with regular usage they’ll quickly disappear. So Step 1 is to move the Baby Quasar over each sectioned off area for 2 minutes at either the low frequency (orange LED) setting for sensitive skin, or the high frequencey (red LED) setting for normal skin. So after you’ve completed that process ( = 12 minutes), you repeat the treatment a second time using the continuous wave (green LED) or high frequency settings. Once you’re done, you can go back over special areas of concern for an additional two minutes. When I’m done using my Baby Quasar for the night, I notice that my skin looks smoother, plumper, and just healthier. But I really noticed a difference when I tried the Quasar on my mom–after doing half her face, there was a marked difference. I can’t wait to see the cumulative results of weeks of light therapy! Nicole, whose thoughtfulness is seriously unparalleled, sent me an early birthday gift (my birthday’s not for another month or so) which contained some amazing goodies that I just had to share with you all. 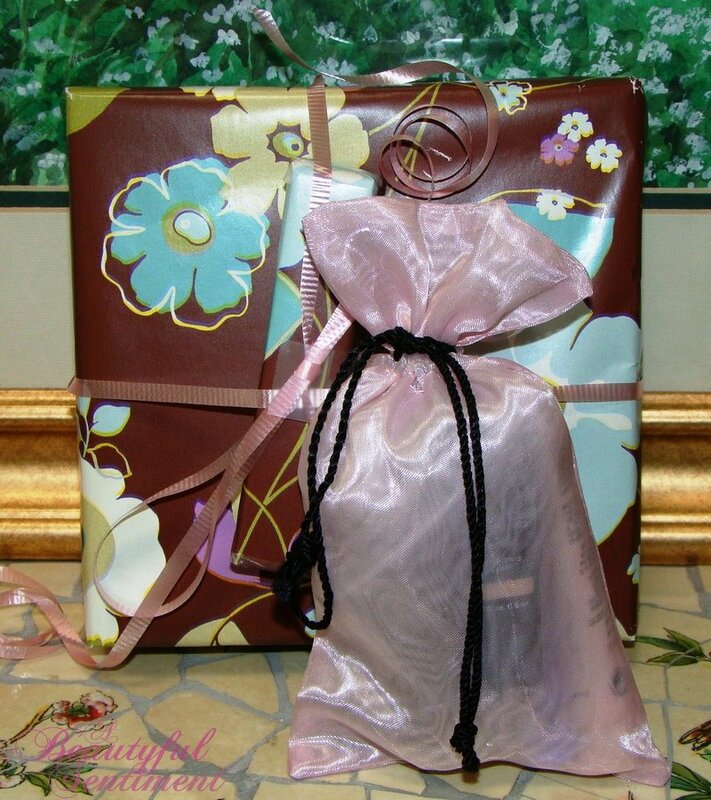 Between this wonderful package and the early birthday gift my mother purchased for me today (an iPod Touch) it’s been a fabulous day! The pretty pink drawstring bag contained samples of Shu Uemura’s Skin Purifier (this will be great for my trip to Korea), Viktor & Rolf Flowerbomb body lotion (one of my fave fragrances), Smashbox Sheer Focus Tinted Moisturizer, Origins Modern Friction, Shiseido Bio Performance Essenec and two Bond No. 9 Scent of Peace samples. 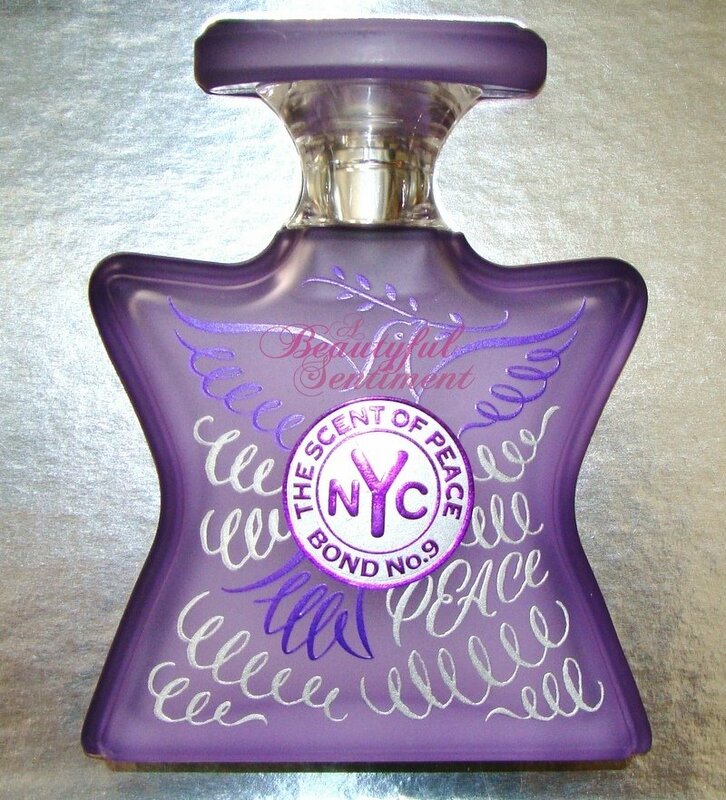 My very own The Scent of Peace fragrance in one of Bond No. 9’s classic flacons. I still can’t believe I now have a Bond No. 9 bottle to call my very own! This will definitely be given a place of prominence on my vanity. She also got me this golden, shimmery Cle de Peau lipgloss in shade #2 which I’ve also been wanting for months and months but just haven’t been able to bring myself to splurge on. Thank you so so much Nicole for kicking off my birthday early and for getting things off to such an amazing start! I may just break into my new fragrance tomorrow, although I’m really not sure that I can bear to mar its beauty by using it just yet.